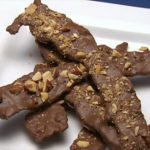 Bacon, Bacon, Bacon...This bacon with chocolate and nuts recipe hits everyone's sweet spot. It's out of sight. Set these out on game day and watch how fast they disappear! On a rimmed cookie sheet lined with parchment paper, lay out the strips of bacon in one layer. Place the cookie sheet in the oven and roast the bacon until crisp, about 20-25 minutes. Take the bacon off the cookie sheet and place on paper towels to rest.Before the bacon completely cools, sprinkle with brown sugar, the shredded Parmesan cheese, drizzle the chocolate (see note) and top with the chopped nuts. Serve each person 2 slices of the bacon, sit back and listen to them rave! Place uniformly pieces of chopped chocolate in the top of a double boiler or a heatproof bowl set over (not in) a saucepan of simmering water; cook, stirring occasionally, until melted, 2 to 3 minutes. Place uniformly pieces of chopped chocolate in a microwave-safe bowl; microwave in 30-second intervals, stirring between each, until melted.